TOP: Some of the books removed from classrooms. 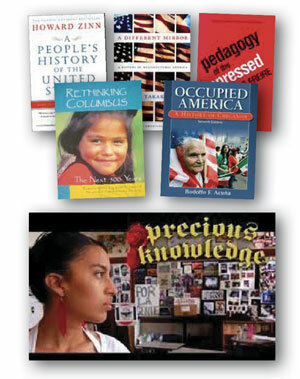 BOTTOM: The film “Precious Knowledge” captures the impact and effectiveness of the Mexican American Studies program in Tucson. For years, I opened my 11th grade U.S. history classes by asking students, “What’s the name of that guy they say discovered America?” A few students might object to the word “discover,” but they all knew the fellow I was talking about. “Christopher Columbus!” several called out in unison. This ignorance is an artifact of historical silencing—rendering invisible the lives and stories of entire peoples. 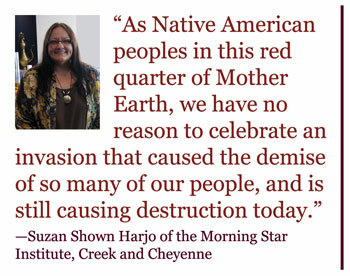 It’s what educators began addressing in earnest 20 years ago, during plans for the 500th anniversary of Columbus’s arrival in the Americas, which at the time the Chicago Tribune boasted would be “the most stupendous international celebration in the history of notable celebrations.” Native American and social justice activists, along with educators of conscience, pledged to interrupt the festivities. Which brings us back to Tucson: One of the most silent of the silenced stories in the curriculum is the history of Mexican Americans. Despite the fact that the U.S. war against Mexico led to Mexico “ceding”—at bayonet point—about half its country to the United States, this momentous event merits almost no mention in our textbooks. At best, it is taught merely as prologue to the Civil War. Mexican Americans were central to building this country, but you wouldn’t know it from our textbooks. They worked in the Arizona copper mines, albeit in an apartheid system where they were paid a “Mexican wage.” In the 1880s, the majority of workers building the Texas and Mexican Railroad were Mexicans, and by 1900, the Southern Pacific Railroad had 4,500 Mexican workers in California alone. Nowhere was this rich history of exploitation and resistance being explored with more nuance, rigor, and sensitivity than in Tucson’s Mexican American Studies program. Like Rethinking Columbus, Mexican American Studies teachers aimed to break the classroom silence about things that matter—about oppression and race and class and solidarity and organizing for a better world. Watch Precious Knowledge, the excellent film that offers an intimate look at this program—and chronicles the fearful, even ludicrous, attacks against it—and you’ll get a sense of the enormous impact this “rethinking” curriculum had on students’ lives. This coming Monday, October 8th is the day set aside as Columbus Day. Let’s commit ourselves to use this—and every so-called Columbus Day—to tell a fuller story of what Columbus’s voyage meant for the world, and especially for the lives of the people who’d been living here for generations. And let’s push beyond “Columbus” to nurture a “people’s history” curriculum—searching out those stories that help explain how this has become such a profoundly unequal world, but also how people have constantly sought greater justice. This is the work on which educators, parents, and students need to collaborate. If you care about nurturing a people’s history and ending Arizona’s ban on ethnic studies, click here to find out how you can take action. This column was first published at GOOD. Rethinking Columbus: The Next 500 Years. Teaching Guide. Edited by Bill Bigelow and Bob Peterson. 2003. 192 pages. Readings and lessons for pre-K to 12 about the impact and legacy of the arrival of Columbus in the Americas. The Line Between Us: Teaching About the Border and Mexican Immigration.Teaching Guide. By Bill Bigelow. 2006. 160 pages. Lessons for teaching about the history of US-Mexico relations and current border and immigration issues. Posted on October 3, 2012 by Rethinking Schools	This entry was posted in Current events, Curriculum and tagged a people's history, arizona, book ban, children's literature, curriculum, ethnic studies, history, Howard Zinn, mexican american studies, multicultural education, tucson. Bookmark the permalink.